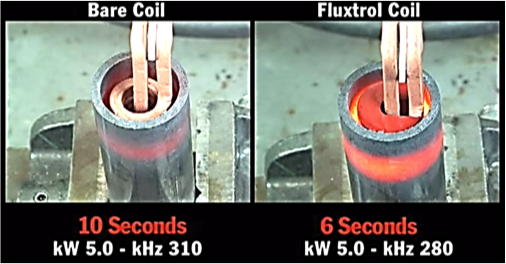 Induction heating is a contactless method, based on heating the bodies by means of energy absorption from the alternating magnetic field, generated by induction coil Ic.There are two mechanisms of energy absorption: eddy current losses and hysteresis losses. Eddy currents Iw are being “induced” in conductive materials by magnetic field that penetrates into the bodies. Eddy currents flow in closed loops inside the bodies and heat them due to electrical resistance of their material. 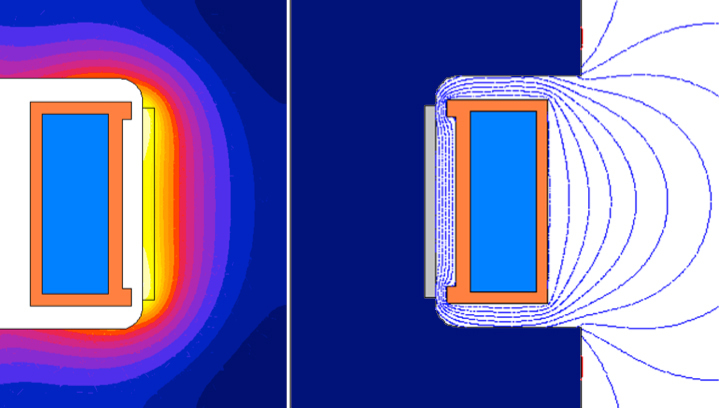 Hysteresis heating occurs only in magnetic materials. They are caused by internal “friction” of magnetic micro volumes (domains), which rotate following orientation of the external magnetic field. 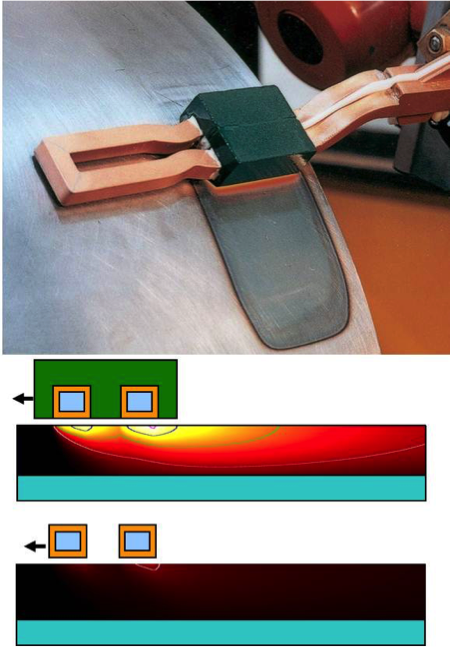 In solid materials, hysteresis losses are much lower than eddy current losses and often neglected in calculations. In particulate materials they are major or even only source of heating. In both cases heat intensity is approximately proportional to magnetic flux value Φ squared. According to laws of physics, magnetic flux flows along the closed path around the coil turns. Magnetic materials provide an easier way for magnetic flux to flow than air. By placing magnetic controllers in specific areas we can control value and distribution of the magnetic flux density B. Depending upon its function (effects), a controller may be called a concentrator, diverter, shield, core or impeder (in welding). On many occasions the controller can play several roles, such as concentrating field in one area and reducing in another. Due to a favorable combination of magnetic, thermal, electrical and mechanical properties, Fluxtrol composites are the excellent materials for different types of magnetic controllers. 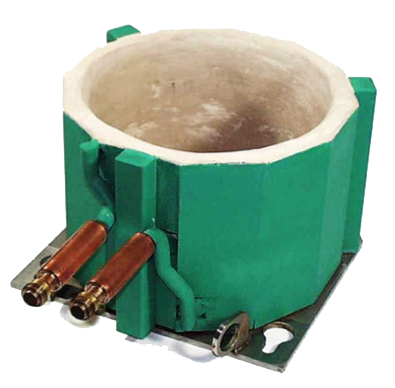 Application of C-shaped concentrators surges magnetic flux produced by the coil current and increases power generated in the part. In addition, the concentrator makes power distribution under the coil “face” narrower and closer to rectangular shape. This results in better utilization of induced power. 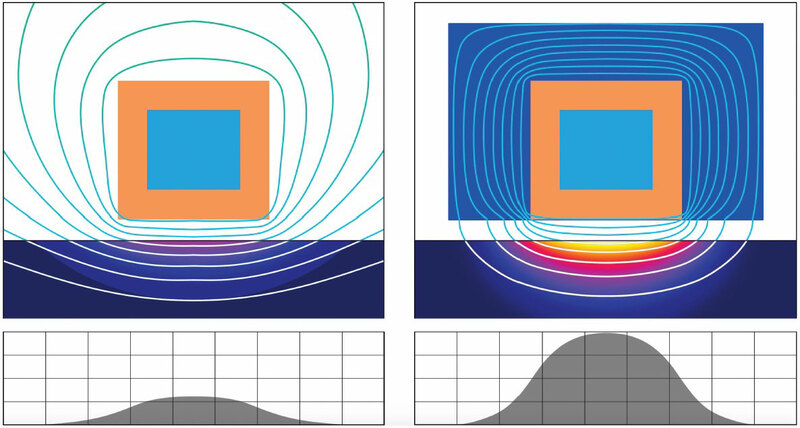 Power distribution along the part surface, magnetic field lines concentration and power density color maps for a coil with and without concentrator. 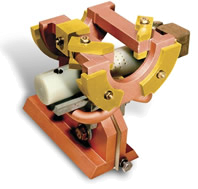 Magnetic controllers, locally placed on a coil for single-shot hardening of shaft, provide effective heat pattern control. 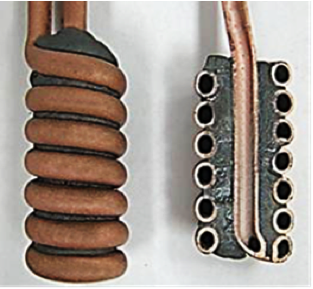 This horse-shoe coil was designed for brazing an output pipe to aluminum car heat exchanger. In addition to big improvement in coil efficiency, the magnetic controller precisely distribute power between three components of the joint guaranteeing high quality of brazing. to comply electromagnetic safety standards on workplaces. 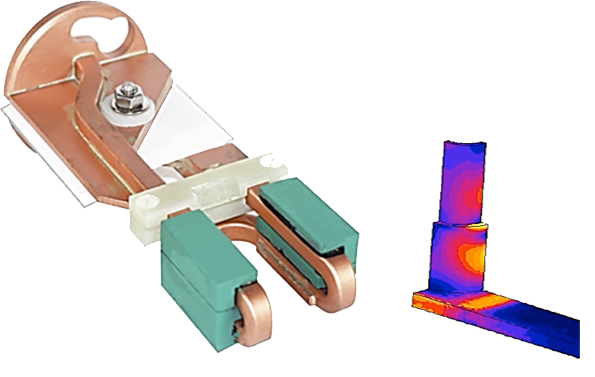 Magnetic flux of bare clamshell coil causes significant unintended heating of the crankshaft web. Fluxtrol composites are excellent materials for shielding when used alone or in combination with Faraday shields (conductive rings). C-shaped controller or even thin magnetic side shields eliminate unintended heating, save energy, improve heat pattern control and reduce the part distortion. In melting furnaces working in a vacuum or protective atmosphere, shielding not only improves the furnace efficiency and reduces the coil current, but also eliminates losses in the chamber. It allows a designer to reduce the chamber dimensions or increase melting unit size for the same chamber. Ceramic-lined induction coil with Fluxtrol A shields (side and bottom) for melting radioactive materials in protective environment (glove box application). 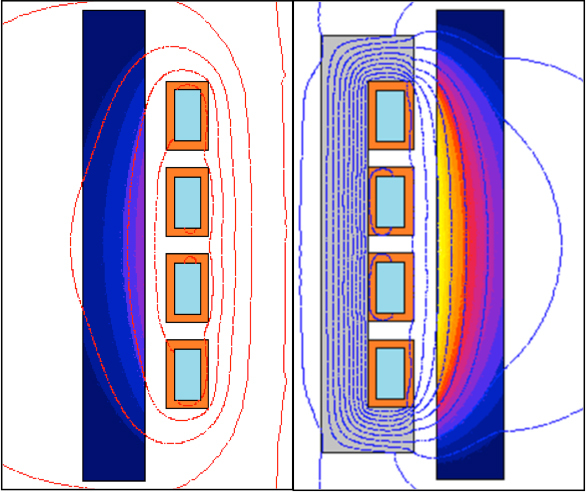 Magnetic flux line and power density distribution in a melting system without (left side) and with magnetic shields. 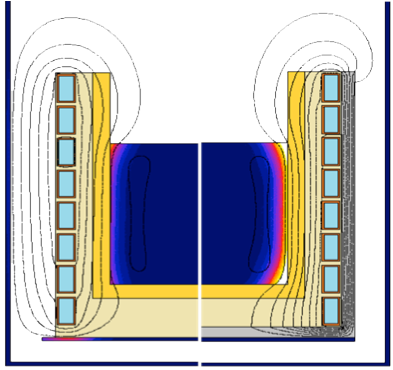 In melting furnaces working in a normal environment, magnetic shielding protects the frame components from unintended heating and strongly reduces the magnetic field on workplaces without impairing the coil efficiency. 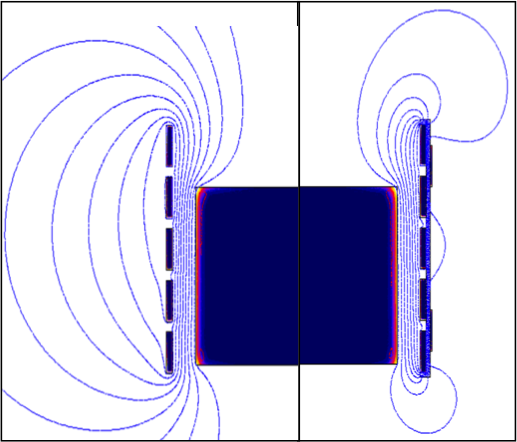 Magnetic flux of hair-pin coil flows through the coil opening, then splitshairpin in two parts, flowing in opposite directions along the part surface and returning back around the coil turns. If the coil opening is small, it reduces a value of magnetic flux and heat intensity. By placing magnetic material in the opening, we increase its “magnetic cross-section” by value of permeability. This results in higher magnetic flux and strongly increases power transferred into the part. Magnetic concentrators improve coil efficiency and power factor. Local installation of the concentrator allows us to redistribute power along the coil length and achieve desired temperature pattern. Computer simulation and demonstration with a coil driven by robot along the water cooled plate confirm effectiveness of magnetic concentrator. 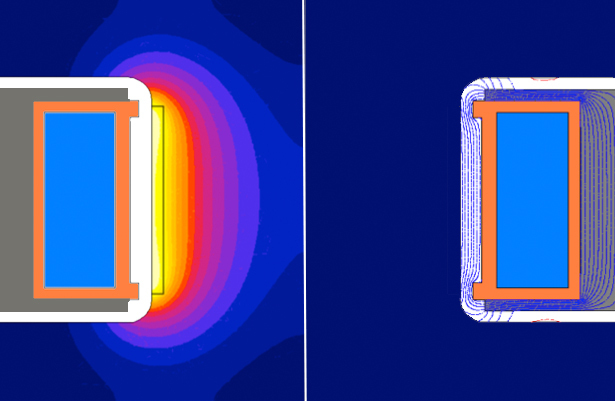 Magnetic cores greatly improve performance of internal coils, especially those with small diameter. 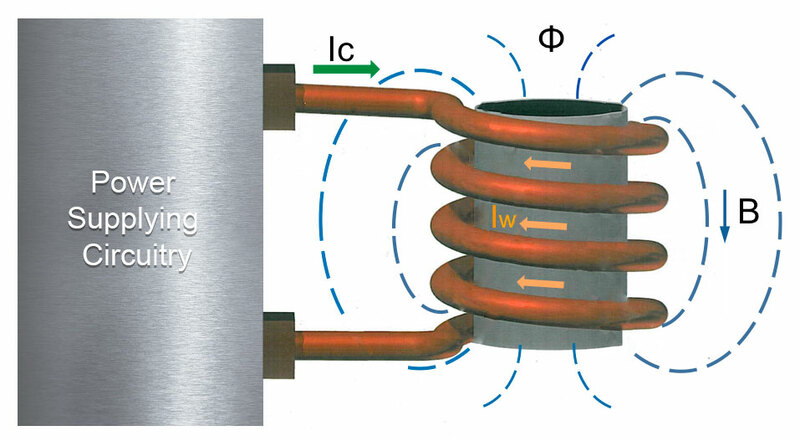 Magnetic flux in bare coils returns through the narrow area inside the coil and significant or even major portion of the coil ampere-turns is being used to push the flux through this “bottleneck”. Higher efficiency and power factor of the coil.